The story about matchmaking is a tale as old as time. Throughout history, there were people who were called matchmakers. Their task was clear – they had to find and connect two people that are perfect for each other. Nowadays, that job is done by a thing called online dating website. There are thousands of them on the Internet, but this one has a very promising name – Professional Matchmaker. If you’re looking for a Canada-based companion, this site might be able to help you with that. Let’s see if this online dating platform can live up to its ambitious name. Well, as we said, if you’re hunting for the eligible singles of The Great White North, you’ve come to the right place. After literally one minute that will take you to sign-up, you’ll notice that this site features a pretty non-inspiring design. Other than that, it has all the necessary features you need in order to find yourself a match. At first glance, this dating website doesn’t seem all that groundbreaking, but give it a chance, you may be positively surprised after you do some serious browsing. You will see that Professional Matchmaker site has a very simple and straightforward interface, so your profile will be up and running in no time. As we already said, the design of this dating platform is pretty lazy. To be honest, there is not much you can do in the feature area, but the background is where designers can be creative. And that wasn’t really the case with this site. The designers left the background completely black. Don’t get us wrong, the site shouldn’t be too flashy either, but this amount of darkness is pretty depressing, and that can’t be good for a dating site. Aside from that, we have to say that features are logically distributed and easily accessible. Everything you possibly need is right there within your reach. Overall, the interface is pretty intuitive and easy-to-use, which is a big plus. When it comes to features, this online dating site, like many others, has a number of useful options and tools that will help you in your search for a companion. Professional Matchmaker provides you with an opportunity to browse for newest members or the ones that are near you. That can be very useful if you’re not able to travel long distances. The Search option is very intuitive as well. You can use Basic or Advanced Search, or you can search By Screen Name or By Interest. If you’re interested in specific age, you can also enter the age range that you’re looking for in order to narrow down your search. Quite handy. However, the search is just one part of the online dating game, you also need to represent yourself the best you can. 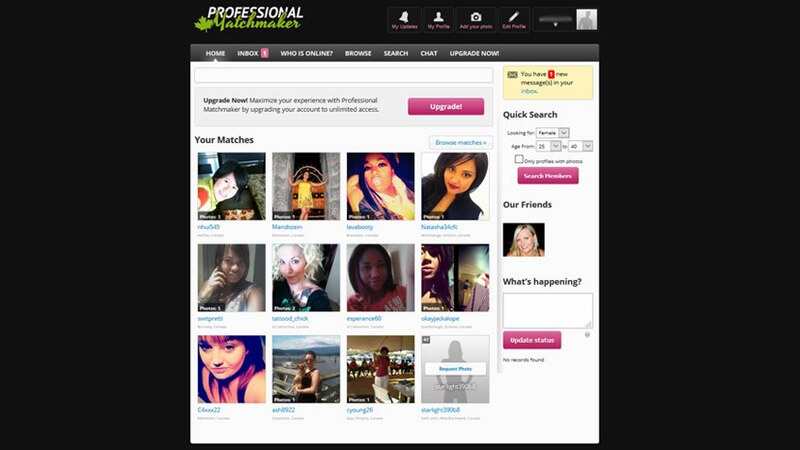 Features like Edit Profile, Add Your Photo, My Updates and Chat will allow you to express yourself and attract potential matches. Well, we came to the most important section of every dating platform out there. You may think that this site’s member base looks a bit thin, but all you need to do is give it some time and dig a little deeper. After you complete your profile and upgrade your membership you’ll be able to experience the variety of members this dating site features. All the users are interesting, approachable and open to new experiences. So, if you’re interested in finding a Canada-based companion, you should definitely give Professional Matchmaker a chance. It’s not the most elegant and most beautiful dating site you’ll ever see, of course, but the necessary features are all there. You have nothing to lose, give it a go!